Here you learn how delete the 1200 error in printers Lexmark X4250 / X4270 / F4270 all in one. 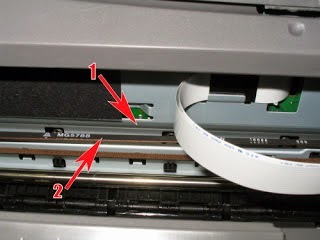 In these Lexmark printers this problem can be caused for various reasons, one of them is that the cartridges are not correctly fitting in the carriages, another one can be that the band that moves the cartridge carriage is out of place, finally there is the possibility that the cartridge carriage is being obstructed by some object. Next we will show a image where you can identify which are the pieces (encoder strip) and the band that moves the cartridge carriage. To solve the problem in case the ink cartridges are not correctly fitting: to do so the procedure is quite simple, follow the steps as they are shown next and you will have a possible solution. Unplug the printer power supply cable, to do so you can unplug it from the printer of from the socket in the wall. When your printer is unplugged what you have to do is to open the top cover of the printer, the one that gives access to the ink cartridges. As it can be seen in the image only the the top part corresponding to the band that moves the cartridge carriage is being pulled, you should move this one to where the red arrow shows. Do this procedure very slowly, remember that if the band is not moving is because you have not turned off the printer you have not unplugged the printer power supply cable. Take out and place in the cartridges again, when the cartridges are placed again you will hear a click that indicates the cartridge is in the correct place, net we will show you images of how the cartridges must go, look at the top side of the cartridge where this one fits in the carriage. Until you hear the click it is advised to repeat the action. 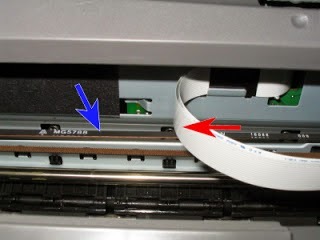 Close the top cover giving access to the cartridges previously opened, now plug the printer again, if after this procedure the printer still indicates the same error you should check if the band that moves the cartridge carriage is out of its place. Turn off the printer one more time, it can be done using the ON/OFF button or unplugging its power supply cable, however remember you must remove any power supply to the printer since your hands will be inside the machine, to avoid exposition to electricity unplug the printer. Open the doors giving access to the ink cartridges, as shown in the previous procedure, place the cartridges where they can be removed and remove then again. Now look in the back side of the cartridge carriage, right under the encoder strip where the band that moves the cartridge carriage is held, look for in the place shown in the next image. Right behind the cartridge carrier there is the groove the exactly fits with the band that moves the carrier, it is possible that this band is out of its place or is about to be out of its place, it may be causing the 1200 error. What you have to do is to try to place it right in case it is not, in case it is completely out of it place you will have to totally remove it and carefully place it again. 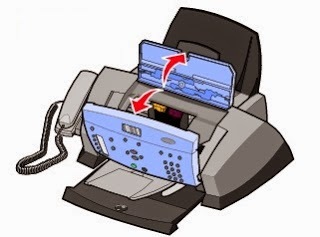 After having the carrier in the right place, you have to put the cartridges again, close the two opened doors and plug and turn on the once again the printer. If the error still remains you will have to check if there is something obstructing the coming and going of the cartridge carrier. 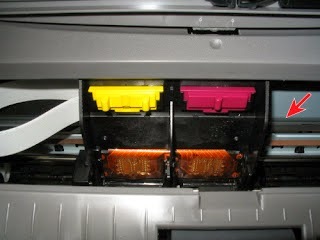 To do so you will to do the same previous procedure, always taking into account to avoid being exposed to electricity by turning off the printer, move the cartridge carrier to the center, remove the cartridges and check the path of the carrier cartridges, also take a look of the place where the ink cartridges lie. It is possible to find a little bit of paper there and it must be removed as well as any other piece of paper found there. As a last resort and if needed you will have to check what is the state of the iron pieces where the cartridges pass by, they could be corroded and in this way obstructing the carriage process, in this case it is recommended to grease those pieces with penetrating or any other type of tick heat-resistant grease.